Eraring power station is a 2,880-megawatt (MW) coal-fired power plant in New South Wales, Australia. The map below shows the location of the plant, near Dora Creek, New South Wales. Eraring Power Station, owned by Eraring Energy, is one of two coal fired electricity power stations on the shores of Lake Macquarie, in New South Wales, Australia. It originally had four 660 MW steam driven turbine generators, with a total capacity of 2,640 MW of electricity. Along with the Bayswater Power Station in Muswellbrook, the Eraring station is Australia's largest emitter of carbon dioxide. Eraring Power Station burns 5.2 million tonnes of coal per year, provided by five local mines, and uses salt water from Lake Macquarie for cooling. The company also states that approximately half the fly ash is "sold for use in the manufacture of concrete and building products and in road base" with the ash handling plant collecting furnace ash "and economiser grits and conveys them as slurry to the ash disposal area." The generating capacity of each of the four turbines was upgraded from 660 MW to 720 MW between 2011 and 2012. On July 3, 2008, Greenpeace activists shut down a portion of the Eraring Power Station by chaining themselves to a coal conveyor. Eraring Power Station releases nearly 20 million tonnes of greenhouse pollution into the atmosphere every year. 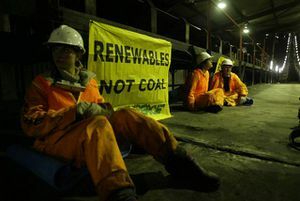 At dawn on July 3, 2008, 27 Greenpeace activists entered the Eraring Power Station site to call for an energy revolution take direct action to stop coal from being burnt. Twelve protesters shut down and chained themselves to conveyors while others climbed onto the roof to paint 'Revolution' and unfurled a banner reading 'Energy Revolution - Renewables Not Coal'. The action preceeded the Australian government's climate change advisor Professor Ross Garnaut's delivery of his Draft Climate Change Review on July 4. Police arrested 27..
A September 2017 study by Environmental Justice Australia criticized Eraring's long-standing exemption from the national nitrogen oxide emission standard of 1,500 mg per cubic metre. The study also criticized the absence of air pollution monitoring within 25 km of Eraring and the nearby Vales Point power station. “Hundreds of thousands of people living near Australia’s largest power station do not know what they are breathing," the report states. In October 2018 Origin Energy obtained approval from the EPA to expand the plant's ash pit, which is located above the abandoned Awaba Colliery, creating a danger of surface water flowing from the ash dam into the mine workings and eventually into nearby tributaries of Dora Creek. In December 2017 Origin Energy announced that it would close the plant by 2032 as part of a plan to reduce its carbon emissions by 50% by that date. Environmentalists criticized the move as insufficient, and noted that the closure date marked the end of the plant's 50-year life cycle anyway. "Given that Eraring makes up approximately 70 per cent of Origin’s overall emissions, the company is committing to increase its carbon pollution across the rest of the portfolio," noted energy analyst Dan Goucher. ↑ "Climate Camp Hails Greenpeace", Climate Camp Australia website, July 3, 2008. ↑ Eraring Energy site, accessed November 2008. ↑ Eraring Energy, "Coal supply", Eraring Energy website, accessed May 2011. ↑ Preliminary Project Application (PDF). Environmental Assessment Scoping Report - Eraring Energy: Eraring Power Station 750 MW Upgrade. Planning NSW (22 August 2006). Retrieved on 25 January 2012. ↑ Environmental report slams Vales Point and Eraring Power Stations, Coast Community News, 15 Sep 2017. Wikipedia also has an article on Eraring Power Station. This article may use content from the Wikipedia article under the terms of the GFDL. This page was last edited on 21 November 2018, at 11:54.